T&T reader Mort Snerd was trying to post these images in a comment to a recent Spector entry but was unable to because of the limitations of blogger. He then emailed them to me at the blog and I am posting them as an entry. 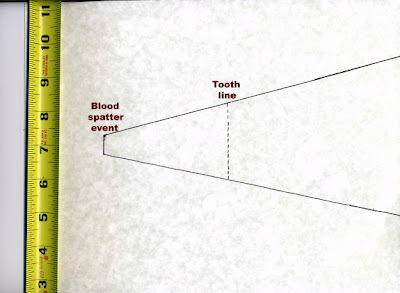 Photo #1 called cone, is a 1:1 scale drawing to the medical examiner evidence introduced at trial. 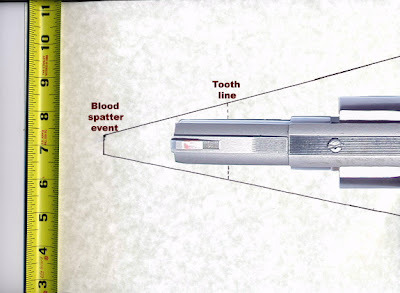 The bullet impact area was defined as 1/2" in diameter with the front teeth 2.5" in front of it. It was also stated that LC's mouth was 2" wide at the line of her teeth. 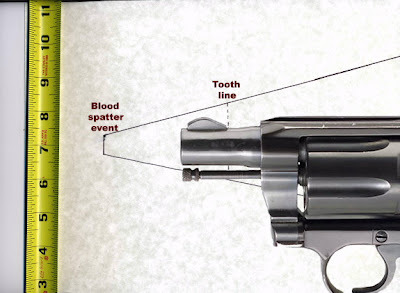 Photo #2 called gun & cone side view is a Colt Cobra identical to the death weapon and placed into the "cone" as far as the medical examiner stated it was. Photo #3 called gun & cone top view is a Smith & Wesson .38 short barreled hand guns and I do not own a Colt Cobra and used the Smith as a demonstration only and again it is inserted into the "cone" as far as the medical examiner stated it was. My question: If as the defense claimed there was an "explosion" of gas, blood, teeth and tissue expelled from LC's mouth, where was it possible to have been expelled from? There is only 1/8" maximum spare space surrounding the gun? Thank you Mortie. Hope we get some responses and an interesting discussion going in the comments area. Wow. Just "Wow". Those images really explain the lack of spatter on Spector, don't they? With the gun blocking so much, if you take into account that there were probably 3 hands (Phil's on the grip and trigger and Lana's on his hand and the gun.) in the way as well, the blood couldn't have gone very far at all! The lips and soft part of the mouth would be forced open by the gas. The tighter her lips were sealed around the barrell the more blowout of blood, GSW and fluids. This cone drawing may have misled people. Also the Cobra is not made of steel and is very light. The recoil would have sent the gun up and back violently. If the gun weighed more the back-blast would have been less. I hope that answers any questions. If you look at the drawing, I used her tooth line as the limiting factor. There was no evidence that her jaw was dislocated by the gas pressure which by Boyles law of physics and calculation was not more that 450 PSI at the time of the discharge. Also, please note that while the gun only weighed 1 pound, it had a STEEL barrel and cylinder with aluminum frame. The gas weight is much less that 1 pound and therefore would be expelled from the mouth BEFORE the gun recoil knocked out the front upper teeth. I am not trying to mislead anyone. I saw the making of a film of where the cobra with +p ammunition was stuck inside a little hole in a small watermellon. What a mess it made and the watermellon split open. It was stronger than the woman's soft mouth tissue. The test was not valid enopught to enter as evidence because a watermelon is not a living human mouth. There would be a spray and the recoil from the lightweight gun is substantual making even more mouth trauma. Blowing out her teeth caps was simple. Your S&W pictured is a lot heavier and has much less recoil. The Cobra was NOT designed to shoot the higher powered +p rounds either. Every expert has the same problem with this. No live person will submit to a real test. A corpse can not be used because there is no blood movement in dead people. There are videos around of actual inter-oral gunshots by sucidal people and it's always a bloody mess with spray. I know of none involving a Colt Cobra though. There is no way for there not to be spray on either jacket sleeve of a person holding a Cobra in a person's mouth. The question is just how much spray would result. what if, while struggling for control of the gun, Miss Clarkson was gripping Phil Spector's wrist to try to get the gun pulled from her mouth and in the process pushed his sleeve further up his arm? would there still be 'no way' to avoid spray on the jacket sleeve? the sleeve would not only be well above wrist length and further from her mouth, but might have also been covered by her hand/s when the gun went off. also, wasn't Phil Spector wearing a woman's jacket that night? I can't remember from those pics of them in the parking lot how well or poorly it fit him, but depending on the style or whether it was oversized, for all we know the sleeves could have been wide enough to push up to his elbows. also, there are elements of the spray/spatter analysis (including where the explosion of blood *didn't* travel) that strongly suggest he was at an extremely close range when the gun went off. that alone is contrary to his claim Miss Clarkson committed suicide while he was out of the room. in fact, the presence of any spray or spatter on his jacketis is contrary to that claim unless you believe the defense experts and not even Juror 10 believed them. question, hope someone can help...I'm a student of astrology and turned up two birth years for Phil Spector (1939, 1940). does anyone know which year is right? don't know if anyone is interested in astrology, but even without the correct year, just looking at his day of birth it appears a trial starting in early 2009 would be less favorable to him than one beginning in fall 2008. majorly stressful transit of Pluto to his natal Sun will be on the approach in early 2009. doesn't mean he wouldn't be convicted at a trial starting in 2008, it's just that Pluto conjunct Sun is a difficult transit for anyone, let alone someone on trial for second degree murder. The Smith and Wesson in the picture looks very much like a 2 1/2 " bbl Mod 66 .357 magnum. That's a very heavy gun with little recoil. The barrel on the Cobra is tapered and the S&W is what they call a bull barrel. This is just not a fair representation. The sight ramp is much higher on the S&W also. "...question, hope someone can help...I'm a student of astrology and turned up two birth years for Phil Spector (1939, 1940). does anyone know which year is right?" Benjamin and Berth settled in the South Bronx, and their first child, a daughter, Shirley, was born in 1935. Then came tragedy. Bertha gave birth to a son who died when he was just two days old. The birth of a second son, then, was a cause of particular joy. According to his birth certificate, Harvey Philip Spector was born in the Prospect Hospital in the borough of the Bronx on December 26th, 1939--a birthday he shared with Mao Tse-tung and Henry Miller. But the birth was sufficiently close to midnight of the previous day for Bertha to tell friends that the certificate was wrong, that her son had actually been born on December 25, and, as she would joke, that she had "given birth to the second Jesus." This confusion over Spector's birthdate would be compounded in later years, when the year of his birth was misreported as 1940--an error that was perpetuated thereafter. For reasons that are unclear, he would also decide to add a second l to the name Philip. sprocket...thank you for the info. honing in on the time of birth is also very helpful. the best chart interpretations require an accurate birthtime, which establishes the degree where the chart begins and the houses in which the planets fall. and wow...Wow...WOW. born in 1939, and even loosely applying a 'close to midnight' time of birth, the overwhelming likelihood is that Phil Spector has natal Sun opposite natal Moon. this means that as transiting Pluto approaches his natal Sun, it will also be approaching opposition to his natal moon. so what I said about 'stressful transit?' multiply 'stressful' by any big number you like and you may not be too far off in assessing how greatly the difficulty increases with both Sun and Moon receiving simultaneous stress from Pluto. Ironically enough, Pluto in hard aspect to Moon can often be indicative of difficulties with women. Pluto in hard aspect to Sun can be indicative of challenges to self perception (ego) and/or vitality. but those are very general descriptions--further, more accurate interpretation could be drawn with an exact time of birth, because the house locations of Sun and Moon would pin down which areas of life are most likely to be impacted by the transit. also, for Phil Spector not to have this natal aspect of Sun opposite Moon, his mom would have had to be taking enormous license with the term 'close enough to midnight'. for the moon to have passed out of opposition range, Mr. Spector's birth would have had to occur late afternoon on the 26th. his chances for a favorable resolution very likely would have been better last year. it's a pretty safe bet that four years' worth of delays were not to his benefit. even with a re-trial that begins in fall 2008(while Pluto is retrograding into Sagittarius and away from his Sun/Moon opposition), a trial that's as lengthy as the first could have a verdict coming down in early 2009--in that case the potential Pluto trouble would still be in effect, because by that time it will have gone direct and resumed its approach to Mr. Spector's natal Sun/Moon opposition. in fact, this stress will be in play for quite some time afterward. even when Pluto goes retrograde again in April 2009, it will station retrograde on his Sun, and won't retrograde far enough from it to provide a respite. but the retrograde station is itself significant--it can be extremely potent when making a hit to a personal chart point. the entire situation practically provides a textbook demonstration of what astrologers often say about major Pluto transits--you can't fight them. the more you try to fight the influence, the more it will make itself known. there are additional stresses to his chart (for one thing his Sun Moon opp is making a t-square to natal Jupiter at the Aries point--a t-square is by nature a stressful configuration and the Aries point is one of--if not THE--most potent degree of the zodiac). and again ironically--one of the things Jupiter represents is freedom, another is justice. so even though I'm an astrology student and not an astrologer, I'm pretty confident that just about every astrologer on the planet would make the call that Pluto applying to a Sun/Moon opposition would be the dominating chart influence...BY A LOT. well, thank you again...I'll probably follow the re-trial with the chart nearby. if anyone's ever able to pin down an exact birth time, I'd appreciate the heads-up :) I do keep up with this blog or could exchange email addys. 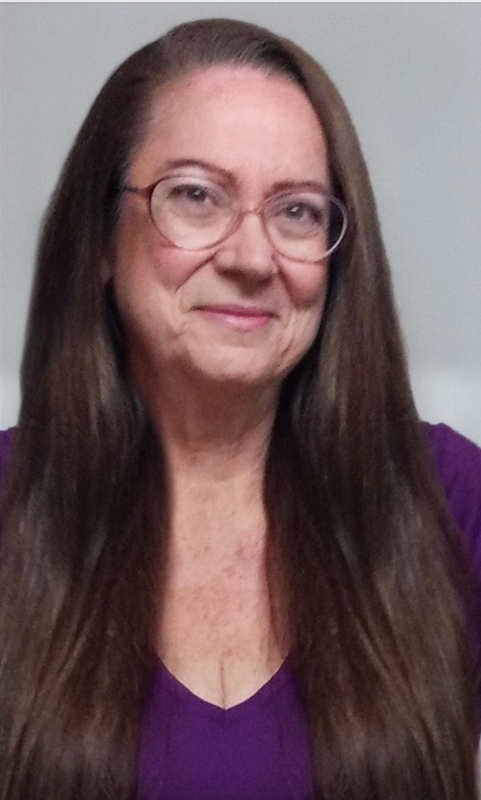 You are always free to email me at the blog. A link to my email addy is on my profile page. I will pass on this request to Mick Brown, who may have seen or have a copy of, Spector's birth certificate. Cesar Laurean – Did He E-mail the Sheriff? Were Warnings of Abuse Simply Ignored?